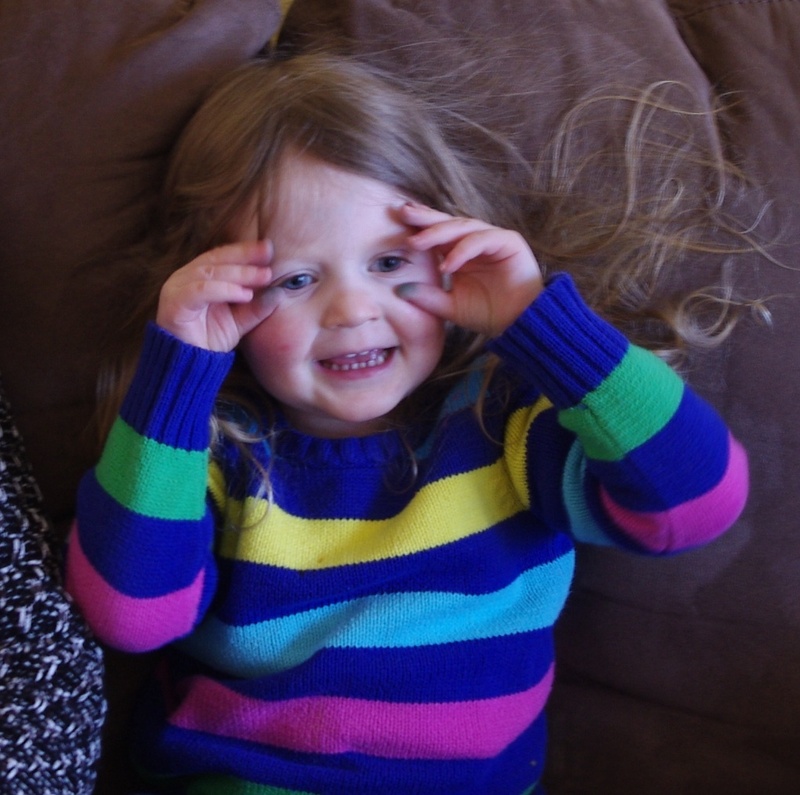 I love my mother, I love my niece. One blonde, one strawberry blonde. Together, they are an amazing combination of laughs, beauty and bliss! Too blown out on chocolate from the Valentines chocolate-a-thon, I opted for making the birthday gals something lighter, more tart and summery. I was hoping to channel warmer weather and sun. Did it work....no. Did the cake taste summery, yes. Does the mascarpone frosting taste just like homemade strawberry ice cream, yes. If you leave this page with anything, take the frosting recipe with you. 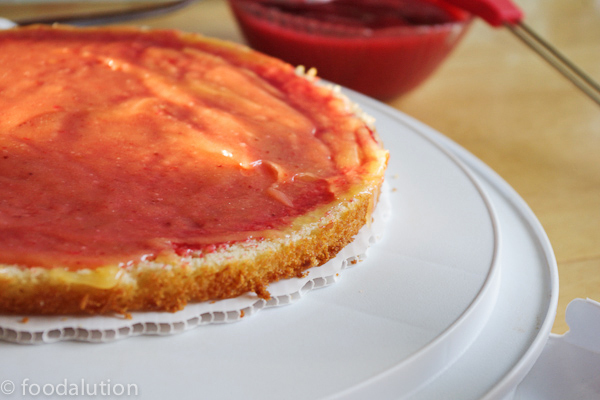 Strawberry puree and lemon curd make a delicious pink filling. 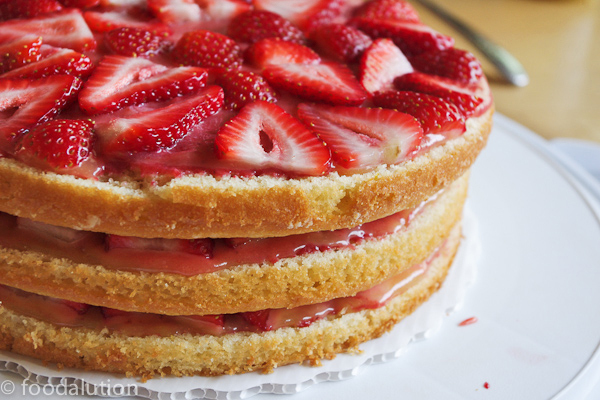 Strawberry blond lemonade cake with strawberry mascarpone frosting. A great cake for the three year old and the 63 year old. Aha ~ The all ages cake! We are lucky enough to have a dairy farm close by that produces some the the sweetest, creamiest, most delicious mascarpone cheese that you will ever set your taste buds on. Crave Brothers mascarpone cheese is decadent beyond belief and pairing it with sugar, more heavy cream plus homemade strawberry puree is simply a stellar combination. If interested in trying out some of their delicious mascarpone cheese, you can purchase it here -online. As it turned out, the 3 year wanted nothing to do with the actual cake, just the frosting. I would too if I looked like this and my parents let me hop myself up on sweets......We piped six more rosettes onto her plate and she scooped them up like ice cream. The sixty-three year old birthday grandmother, ate the cake, frosting and then more cake! Boo! I'm 3 and cute and love frosting! Place strawberries in small sauce pan with the sugar. 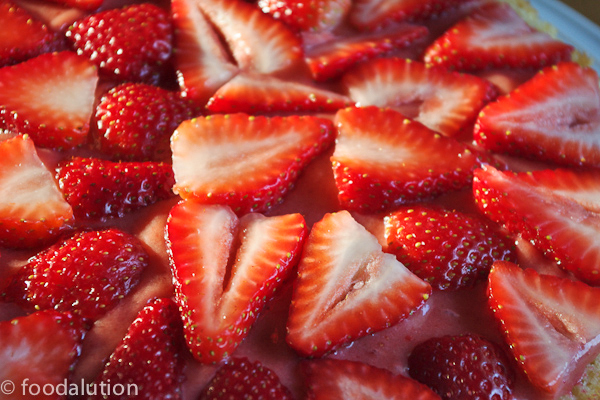 Let the strawberries and sugar cook for about 10 minutes or until the mixture begins to thicken a bit. Place mixture in blender. Puree the berries. Scrape out into bowl, let cool in the refrigerator. You should have around 1 cup of puree or a touch less. If mixture is too runny, reheat until thick. Lemon Cake: Your cake choice is up to you, I chose a buttermilk lemon cake that I found off of epicurious. I found it a bit heavy and next time would go for a lighter cake. The cake was better after it had a day to sit and soak up the strawberry puree and lemon curd. You may even want to do a really light cake made with loads of egg whites. This would give you a nice sponge for soaking up the puree and lemon curd. Grease and flour 2, 9" cake pans. Line with parchment and grease and flour again. Position rack in center of oven and preheat to 350°F. Beat sugar, butter and lemon peel in large bowl until light and fluffy. Add eggs 1 at a time, beating well after each addition. Beat in lemon juice. Sift flour, baking soda and salt into medium bowl. Stir dry ingredients into butter mixture alternately with buttermilk, beginning and ending with dry ingredients. Divide batter among prepared pans. Bake until tester inserted into center of cakes comes out clean, about 30 minutes. Transfer pans to racks and cool 15 minutes. Turn out cakes onto racks and cool completely. 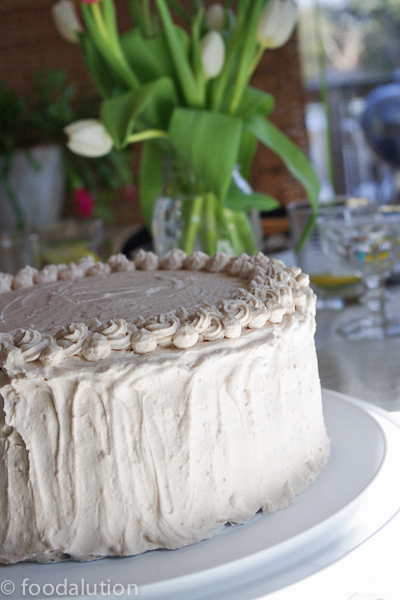 Or.... for a lighter cake - Check out another post of mine and use this cake recipe. Lemon Curd: I use Tiptree Lemoncurd - it is delicious, natural and saves you the hassle of making your own. Stawberries: 1 quart organic strawberries - washed, dried and cut into nice slices as shown above. Whip sugar and heavy cream until you have nice firm peaks. Do not over-beat, you do not want to end up with butter. However, you want your cream to hold up to the cheese that you will be adding. Add in the mascarpone cheese to the heavy cream, whip more until the cream is fully incorporated. Scrape out the frosting and put into a medium sized bowl. 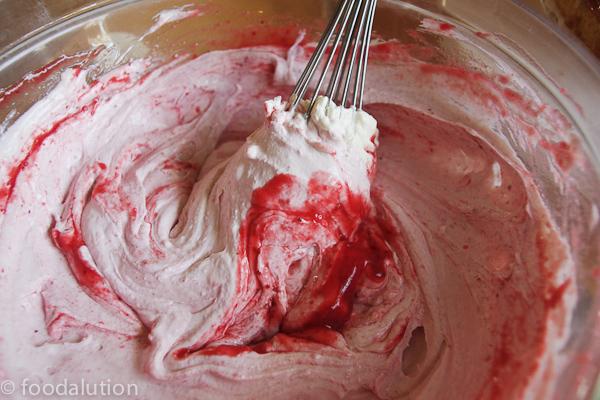 With a wire whisk, add in the leftover strawberry puree and whisk into the frosting until fully combined. Putting the cake together: This is my favorite part. After you work so hard on making the cake just so, and you have all of your other ingredients at the ready, you become the artist and put this beautiful cake together. 1) Slice your cake layers in half. With a pastry brush, brush strawberry puree over the first cake layer, keeping a 1 cm. edge free from the puree. Let puree soak in a bit and brush more on. 2) Spread lemon curd on top of puree. About 1/4 cup each layer. 3) Layer cut strawberries on top of lemon curd. Careful not to place too close to edge of cake. 4) Top with next cake layer. Repeat process. 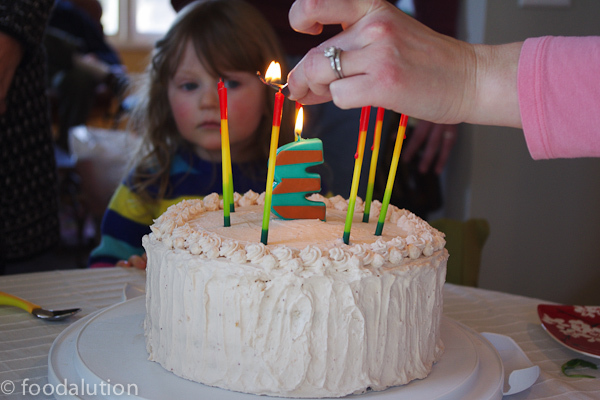 5) Place dowels in cake so the layers do not slide around. I use three. You can cut them to size or use longer ones and then take out before presenting the cake and refrost over the area. This is an important step as nobody wants their cake layers to slide around... possibly off the plate and onto the floor. 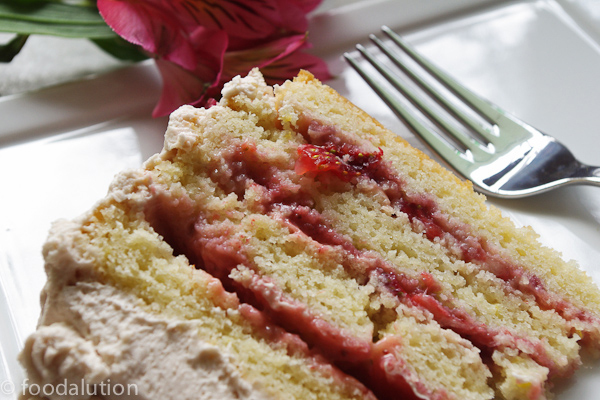 6) Frost your cake with your delicious strawberry mascarpone frosting. Refrigerate until serving. Getting ready for the big birthday song and dance! 1) Valentine's Chocolates were amazing. Crazy busy, but amazing. Thank you to those who purchased and enjoyed the chocolates! Makes me so happy to know that people are enjoying them! Chocolates shipped out to west coast and east coast! I can now make in 3 days what it used to take me over a week to make. Practice, practice, practice. 2) Ecuador chocolate internship is shaping up and closer every day. Slowly collecting the gear I will need. 4) Went back to my favorite 26 poses in yoga! The return of hot-yoga to my life. Yes... sizzle sizzle!! !